We have a homelessness crisis. You need only walk the streets of Brighton and Hove, or any city in the country, to see it. But the street homeless that you see are only the visible symptom, the intolerable crux, of the housing crisis that affects so many people. There are 5-10,000 people sleeping rough, but Shelter (2018)estimates that there are 320,000 homeless altogether counting people in hostels and temporary and emergency accommodation. Even that total doesn’t include the hidden homeless, those sleeping in crowded and unsuitable accommodation, on friend’s sofas, in cars, in boats, in tent encampments. Rough sleepers are not people suffering from some extraordinary illness or incapacity; they are you and me, they are people who have had a bit of bad luck, they are the visible sign of our disintegrating systems for supporting human beings. Their situation is appalling – according to the ONS (2018)the average age at death is 44 for men, 42 for women. In another way, though, they are not visible at all. No-one looks at them, no-one catches their eye; most people ignore them. They are visible only in the same way as graffiti, as an irritation in the corner of the eye. Brighton & Hove Housing Coalition is an organization of activists which tries to change the way that homeless people are seen. When our city is not treating rough sleepers as a nuisance, they still regard rough sleepers as a problem to be solved, or mitigated. We, on the other hand, argue for a different view, that of the rough sleepers themselves, trying to make the establishment see what it is like for them, to see them as people rather than problems. 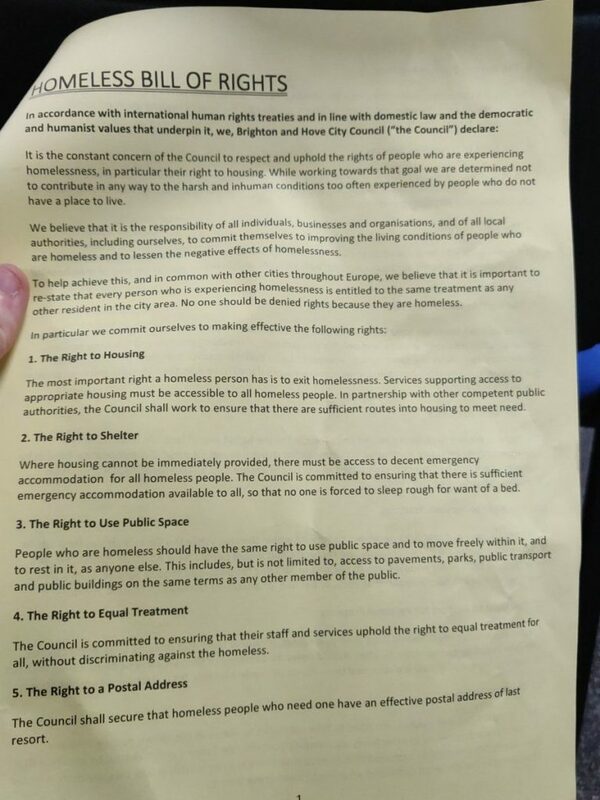 So we came to launch the Homeless Bill of Rights for Brighton & Hove.It has been drawn up by European homelessness organizations, and is full of practical insights into the conditions under which rough sleepers survive. It is the outcome of a European campaign against the tendency to criminalize the homeless and to exclude them from public spaces, pushing them away out of sight. It has been signed by six European cities so far, including Barcelona. We hope that Brighton & Hove will be the first British city to adopt it. Article 1 of the Bill of Rights is the rightto housing to which this country has committed itself in international law. It must be absolutely clear that everyone already has the right to housing, and that the remainder of the Bill of Rights is necessary only insofar as we as a community have failed to implement it. Homelessness is itself a breach of fundamental rights. The other rights address the detailed experience of life on the streets and seeks to make it less unbearable and to make true the equality in dignity and rights that rough sleepers theoretically have. The whole bill, and the story of the campaign so far, may be found at www.homelessrights.org.uk. For this particular struggle, human rights are a good fit. They cut through all the distinctions of domestic legislation, between those with a local connection and those without, and those who have a right to stay in the country and those who have not. Many of the people on our streets do not have immigration status; they are barred from nearly all services and are always in fear of being betrayed to the Home Office for deportation. Human rights refuse that distinction. For Jacques Rancière (Rancière and Corcoran 2010: 62-75), the existing arrangements in society which give everyone their place and role, and which organize and justify that allocation, amount also to a particular way of seeing, a particular arrangement of which people are heard and which are not, which are able to take part in the making of the community and which are not, who is visible and who is not. This is the situation of inequality in which we live. But it is possible to disrupt this situation, to disturb this order of the seeable and sayable, by constructing a dispute or dissensus in order to bring bringing two worlds into collision. Human rights are a writing of the community as free and equal, and they may be used to force such a collision; here, between the world where homeless people are unseen and uncounted, and the world where they are bearers of rights and dignity and speak for themselves within the community. This is what we are trying to do with the Homeless Bill of Rights, here and now in Brighton and Hove; to force a change in what may be seen and heard, a recount in the name of equality. Please support our campaign.